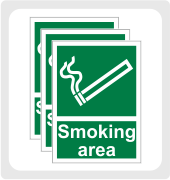 In order to comply with the Smoke Free Law, all businesses must display No Smoking Signs in all enclosed workplaces and vehicles. Businesses must make it clear to all employees, visitors and members of the public, that smoking is prohibited on their premises, anywhere other than in designated smoking areas. 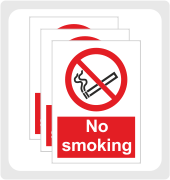 We have a range of different Smoking Signs available to help you get the message across, such as No Smoking Signs and Smoking Area Signs. All of our signs are available in a range of different materials and sizes. Electronic cigarette signs will be available to order online soon.